A timely picture for this week’s Photo Challenge with the theme of “arranged“. My Spanish teacher told me recently that the big days for the Easter celebration are Palm Sunday, Maundy Thursday, and Good Friday. The Sunday before Easter kicks off Semana Santa (Holy Week) with the most significant day being Good Friday. Easter Sunday, she explained, was not the headline act here in Peru. When I asked her about the Easter Bunny, egg hunts, and chocolate bunnies, she told me that those traditions were not popular here. Well, apparently someone is trying to give the tradition of candies and confections during Pascua (the Spanish name for Easter) a jump start. 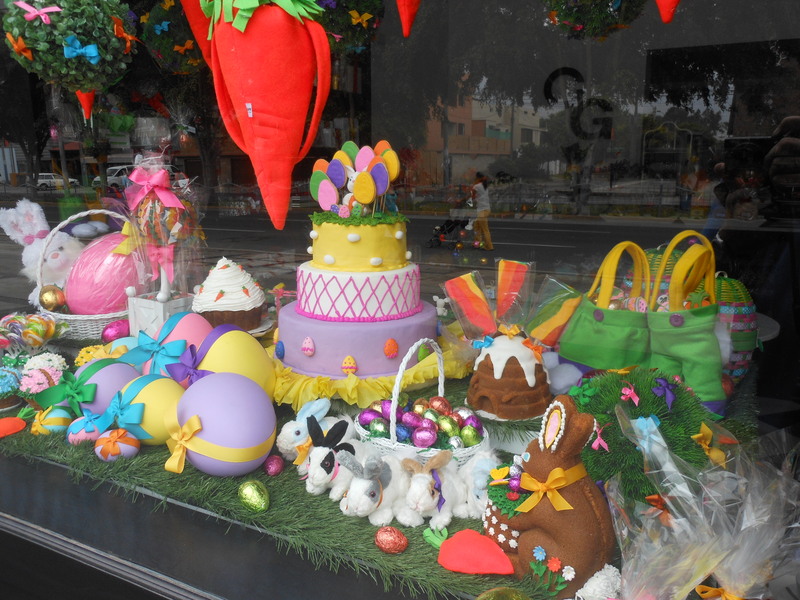 I saw the store display seen below, artfully arranged, to entice people to embrace the tradition of consuming chocolate conejos (Spanish for “rabbit”…I was going for alliteration). Feliz Semana Santa and Happy Easter to y’all. So who knew there was more than one blog site devoted to weekly photo themed challenges? This is what happens when you have a good deal of time on your hands and an Internet connection. Today’s photo challenge theme comes courtesy of PhotoFriday and their theme for this week is “fleeting“. Here in our house in Peru we have a garden. 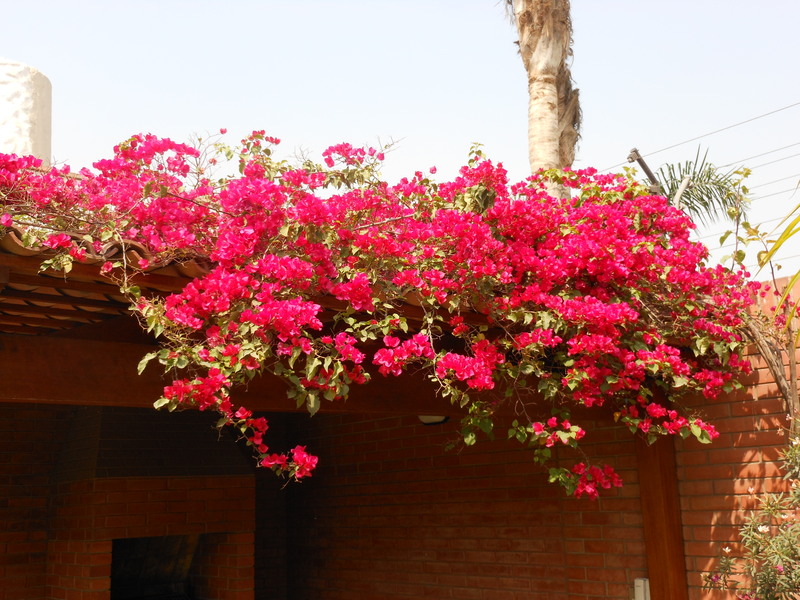 Here in our garden in Lima we have flowers. 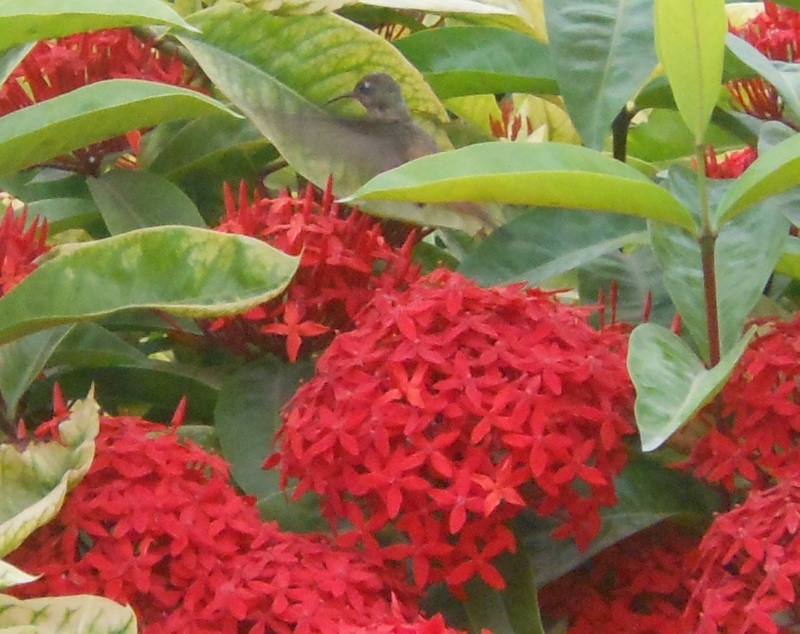 Here in the flowers, hummingbirds like to visit. They’re quick and they don’t stand still for pictures…sort of like our children. Decided to submit a second offering for this week’s Photo Challenge which had the theme of through. 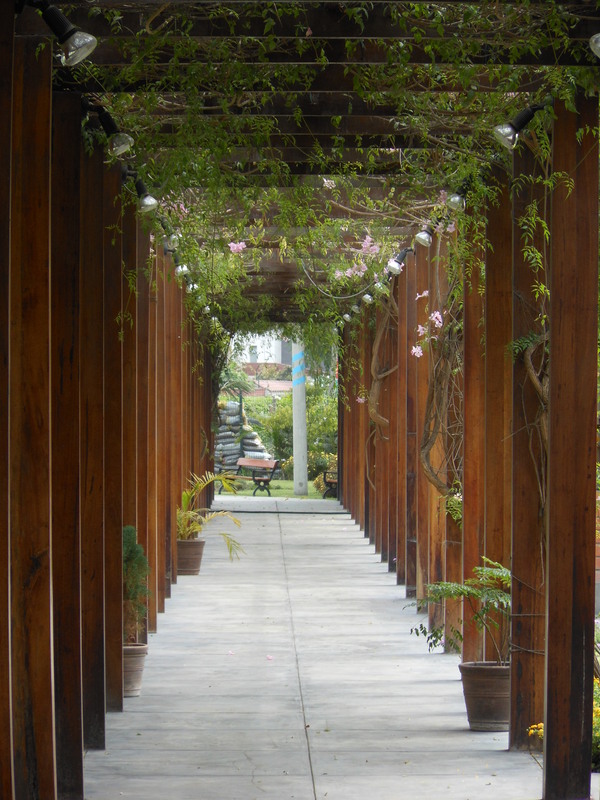 This is a view of a greenery-covered walkway that is part of a senior center located in the Lima suburb of La Molina. Hmmm...I wonder what's at the end of this path? After taking this photo and I sat down and enjoyed the shade of this warm autumn day. As promised, here’s that story for another day. Over this weekend, the family and I, along with mi seugra (Spanish for “mother-in-law”) took a three-hour car ride south down the Pan American Highway and spent a few days in Ica and Paracas. When our weekend fun was over, we all climbed back into our mode of transport and headed back north to Lima. For the most part, the Pan American Highway from Lima to Paracas is a four- to six-lane highway. However, for the first leg of our trip back home, we were on the portion of the road that is only a two-lane highway. I never quite caught the name of the town that we were about to enter (if memory serves, it looked like it was spelled “Auncayo”, but I’ll never know for sure), but traffic in our lane came to a grinding halt. On the southbound lane, there were no cars at all. Five minutes go by. Ten minutes go by and we haven’t moved. Nine minutes and thirty seconds ago is usually in Peru when the horns start going off, but the road was silent as the cars simply waited patiently for something to happen. From the other lane, coming towards us, we begin to see the cause of the hold-up. Marching towards us in crisp precision was a phalanx of police officers. No ordinary officers these as they were clad in riot gear complete with helmets and shields. They were surrounding about forty protesters and they were all making their way south. As we see them, the logjam of cars starts to break up and I begin to see why there was such a holdup. We were approaching a narrow bridge and the police had stopped all the traffic to allow the protesters to cross the bridge safely without having to worry about the traffic. I never was completely sure if the protective circle around the sign-waving crowd was to protect them or contain them. However, I have my guesses. As we crossed the bridge and entered the town, traffic still moved at a crawl. The road was littered with chunks of broken concrete and scores of rocks of all sizes. Folk in this dusty town stood on the side of the road watching the slow motorcade of northbound vehicles. I don’t know how you say “dour” in Spanish, but the adjective fit the line of onlookers. There were no tires on fire, but that was a sight I was expecting to see. There’s a time and place for humor and this wasn’t one of them. We made our way through the small not-so-sleepy hamlet without incident and the rest of the three-hour trip proceeded boringly. Final Note Peru Travel Tip: On long car rides in Peru, it is useless to play the States License Plate Game to distract your children. While Peru does have regions, the license plates of this country only say “Peru” or “PE”…unless you can find a really old car. Just another helpful tip from your Uncle Xavier. Submitted for your approval, a trio of stories about my experiences conversing with the locals in their native language. At my usual corner stop to pick up my daily newspaper, I approach my friendly vendor and asked him for today’s La Republica. Since this is the fourth day in a row that I have bought this particular periodico, the vendor tells me that I do not have to say the whole name of “La Republica”. He helpfully suggests that I can simply say that I want el mismo (“the same”). In one of those odd quirks of Nature, at every job I have held, someone at sometime, has mistakenly called me “Kevin”. I call this odd because “Kevin” is not my name. At one place of employment when I lived in America’s Finest City, a particular co-worker called me “Kevin” time and time again. For the first dozen times, I would correct her, only to have her address me by the incorrect appellation the next time we met. I bowed to the inevitable and, to her and only her, I was known as “Kevin”. Since living in California, I worked for four companies on the East Coast and there was always a moment when someone would mistakenly address me as “Kevin”. Today, we had workers at the house fixing a minor-bordering-on-major maintenance issue and the foreman of the workers arrived to deliver lunch. I introduced myself and walked him around the house trying to tell him what a great job his men were doing. Maybe I just emit a Kevin-Aura. Before lunch, when the workers were here, one of them asked me if there were places to eat in the neighborhood. I wanted to say, “Yes, there are many near here”. In my halting Spanish, I started with “Si, hay muchos restaurantes…”, but then I couldn’t come up with the word for “near”. I know the Spanish word for “far” (lejos), but not its antonym. Sometimes when I don’t know a word, I will break out the pantomime. Here, I started off the game with the question of “Cual es la palabra para…?” (“What is the word for…?”) I then backed away from the worker and said “Lejos” to tell him that I was far, and then I moved up quite close to him and asked “Cual es la palabra para no lejos?” (“What is the word for ‘not far’?”). He eyed me for a moment possibly trying to determine if I was moderately or severely deranged and then he said “Cerca”. Thus, I learned a new Spanish word today. “Cerca” either means “near” or it means “extreme violator of personal space”. I’m pretty sure it’s the first option because the worker did not breaks out in fits of laughter after I told him “Hay muchos restaurantes cerca de aqui”. Back home, the cherry blossoms have reached their peak bloom date. The National Mall and Tidal Basin around the District of Columbia are awash in pink and white and the fragrance of those blossoms greet the throngs of tourists that I and my family would brave every Spring to catch our own glimpse of this magnificent springtime flora. Before moving to Peru, one of the strategies I was given to combat culture shock was that instead of focusing on what I would be missing in my ne location, I should look for items that could serve as substitutes. I could pine away for the fact that my favorite brand of ice cream (or really any type of ice cream) is not available in our local stores. However, I have simply moved to discover all the wonderful cold confections (i.e., chocolate-covered cream bars, etc.) 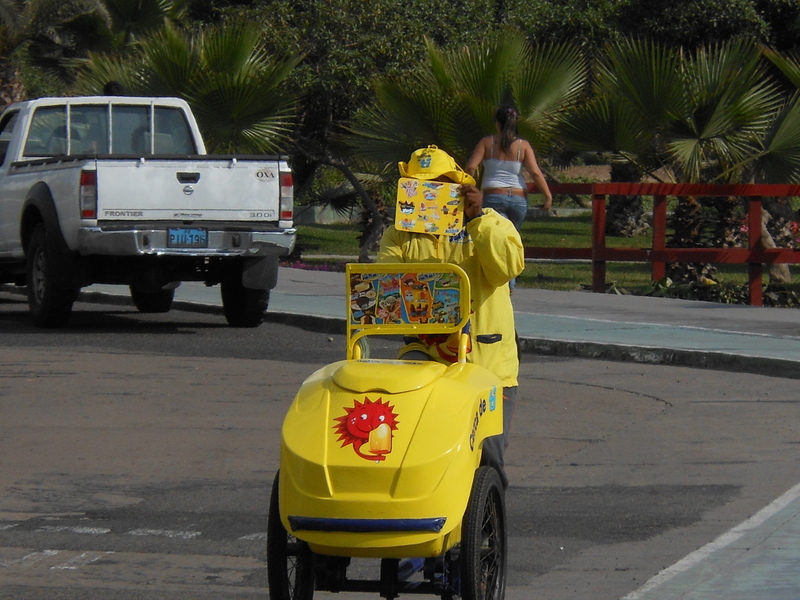 that are available from the yellow D’onofrio tricycles that are everywhere. 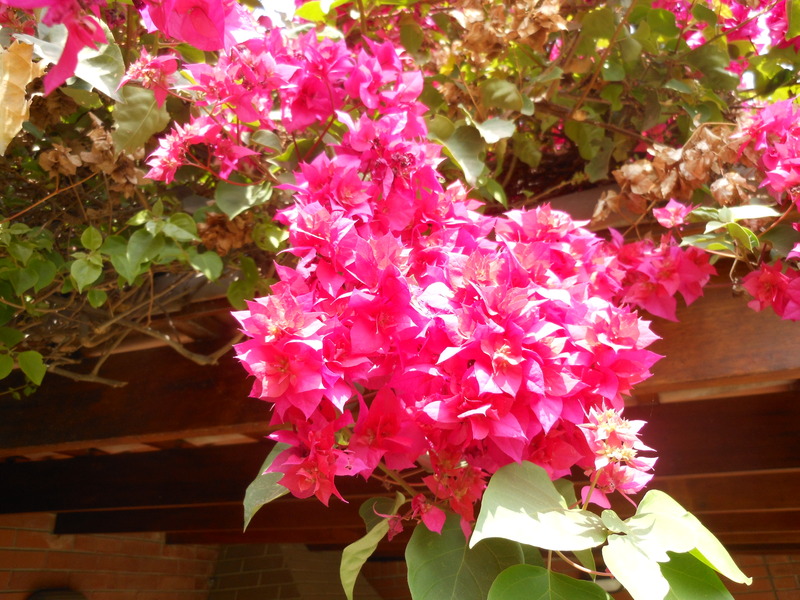 With that concept in mind, I turn from the cherry blossoms a hemisphere away and take a moment to pause and enjoy the bougainvillea flowering in our backyard. 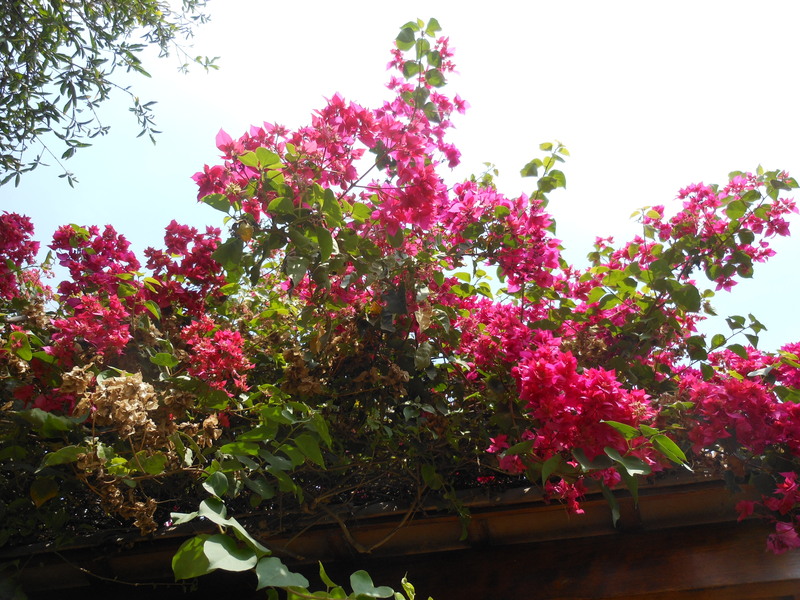 Of course, there is one downside to having bougainvillea residing in such a high place. That would be the shedding. What would work better? Vacuum cleaner or lawnmower? On this Monday, after the children were on their bus and on their way to school, I took a stroll down to our local grocery store. 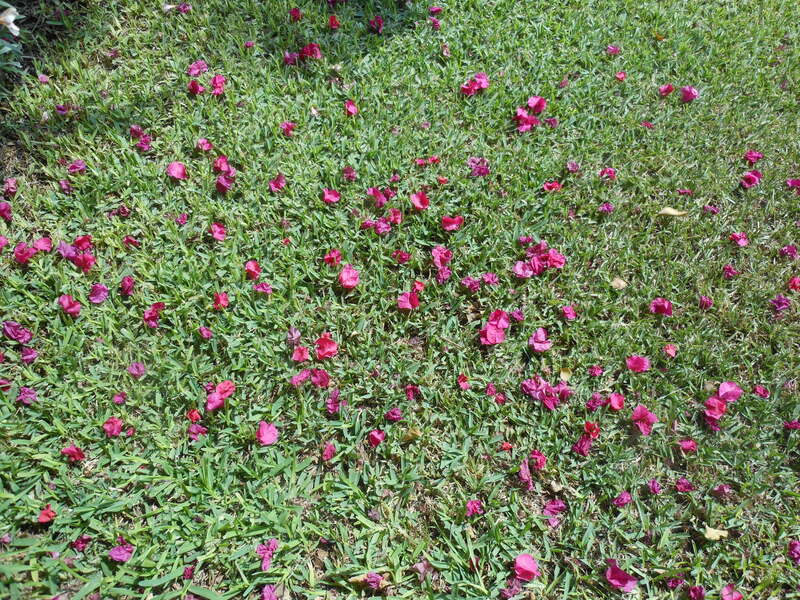 During this particular walk, I was able to accomplish something for the first time. I approached the bust of the man, Raul Ferrero, who gave his name to the street I was about to cross. I was about to stop on the curb and look both ways before crossing the usually busy avenue when I noticed that there were absolutely no cars coming in either direction. Without breaking stride, I bounded across the west-bound lanes, skipped across the traffic island containing the homage to Senor Ferrero, and ambulated leisurely across the street that would have had east-bound cars. For the first time since arriving in Peru, I was able to cross this normally car-clogged street in a single bound without stopping. It truly is the little things that give me pleasure. Once at the local grocery store, I made a purchase but didn’t realize my mistake until I arrived home. I had bought printer paper and it didn’t even dawn on me that I needed to look at the labels. I had been burned before when buying napkins, so I really should have known better. Back in the States, when I went to my local office supply store, the only choice that I had to make regarding printer paper was whether the paper was for an inkjet, laser printer, scanner, or combo (Pedantic Aside: I am an avid follower of the Oxford comma. I think it clarifies things, feelings, and sentiments.). I would simply grab my 8.5 x 11 ream of paper and be on my way. Which is what I did here in Peru, except the size of the paper used here is quite different. Who knew there was a paper format called “A4”? Well, according to this Wikipedia article, the entire world (save the United States and Canada) uses this format as their standard. Thankfully, my printer is smarter than I am and is able to use this format, but I have to keep selecting the “A4” option from my “Print” menu. The start of the week also means the start of a new newspaper for me to read and digest. For more on that, you can jump over here. Along with the format of the printer paper used here in Peru, I also need to learn the proper format of providing a phone number. In the United States, I (and I’m guessing you also) give out my phone number one digit at a time. For example, with a phone number of 202-456-1414, I would say (omitting the area code) “four-five-six-one-four-one-four”. As you may have already surmised, the tradition in Peru is quite different. Given a seven-digit number, the way a phone number is orally provided is by giving out the first number and then saying the rest of the numbers in pairs. The example given above would be said as “four-fifty-six-fourteen-fourteen”. Since I am struggling with my ability to say and understand numbers in Spanish, I still revert to my method of saying phone numbers one digit at a time. Thankfully, all the Peruvians I have had to give my number to have been extremely patient with me. Poco a poco, the saying goes, which means “little by little”. This is how I am learning to be comfortable with speaking Spanish. Today’s experiment was to pick up the phone and call our local bottled water dealer. In my third-grade Spanish, I ask the woman on the other end of the line that I need bottled water. She asks for my direccion and I start to tell her how to arrive at house until I catch myself and remember that direccion means “address” in Spanish. I tell her our street name and number (Digression: In Peru, addresses are said by stating the street first and then the number. So one here says “Javier Prado 804”. Go fig.). She asks me how many bottles I need and how many empty bottles I have. I provide those numbers and she says the truck will be by in the afternoon (la tarde). Now, la tarde can be anywhere from noon to 6pm, so I was expecting a bit of a wait since I made my call at 9am. The water truck arrived at 12:30pm. This week, the theme of the WordPress Weekly Photo Challenge is “through“. I feel extremely lucky that the family and I, along with my wife’s sister, were able to visit the Incan site known as Machu Picchu. Not only is it an incredible and magnificent place to visit, but it is a photographer’s dream. My offering this week is a view of the smaller of the two iconic features that comprise the mountain Huayna Picchu. 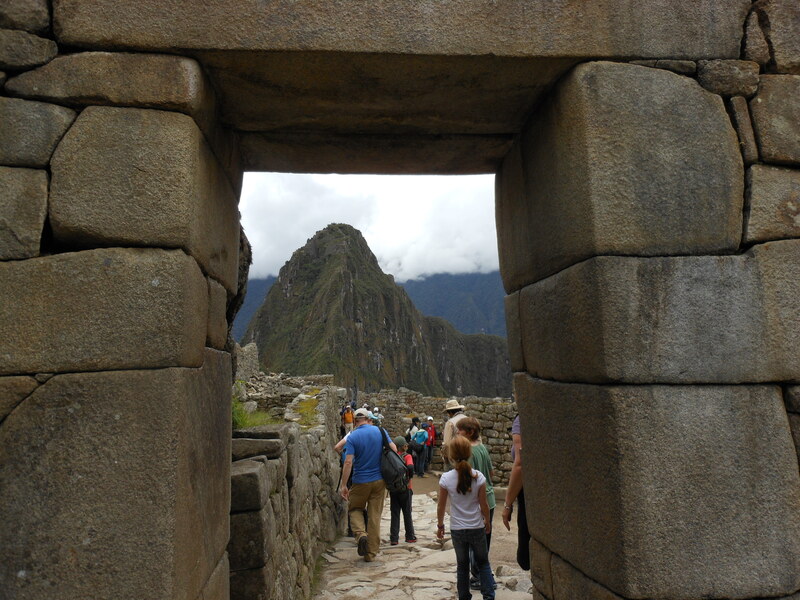 This vista is seen through Machu Picchu’s front door, The Gate of the Sun (Intipuncu). If you haven’t, you really should come see this place. You will literally be awe-struck. George Carlin, one of the funniest, most intelligent people to walk the planet, had a comedy routine dubbed “Seven Words You Can’t Say on Television.” As you might surmise from the title, Carlin spoke of the septet of words that one could not utter over the airwaves. None of these words will be repeated in full in this posting. For the complete list, you may point your browser here. This routine about those seven words is so infamous that it even spawned a ruling from the Supreme Court of the United States that declared that the Federal Communications Commission (FCC) could punish radio and television stations for airing material that contained any of these words (and some extra ones for good measure). In my previous life before my previous life, I was in radio. For four years in college and for a few years after that, my voice rode on electromagnetic waves and could be heard for miles around (but only if you had a radio to receive my ramblings). Talking on the radio meant that I had to be fully aware of what I was saying. Especially on the college station where the atmosphere was a tad more relaxed, I really had to police myself to make sure that no S-words or F-bombs slipped through in my conversations. I certainly did not want the FCC to come down on me and the station I worked for. The FCC has gone to the mat to punish networks that have aired swear words (e.g., Bono on NBC in 2003, Cher on FOX in 2002, Nicole Richie in 2003) and I didn’t want to be on that list. So what does this have to do with my current life in Peru? Because those folks at the FCC who monitor the airwaves for Carlin’s Seven Words would blow a gasket down here because songs are played on the radio here that contain swear words but they are not bleeped out or silenced as they are in the States. My first fleeting example of this phenomenon was when I heard Alanis Morrissette’s “Hand In My Pocket” on the radio. It contains the line, “I’m brave, but I’m chickensh! *”, but it was not censored in any way. Thankfully, the kids (especially our little girl) were not in the car. I thought the playing of the Morrissette song was an aberration, but I heard more and more songs that had the occasional S-word, F-bomb, B-ryhmes-with-rich, etc. thrown in. As of today, I can put my hand on my heart and say that Peruvian radio stations that play English songs (with one exception) do not censor. Today, I was listening to Radio Planeta (107.7 on your FM dial), whose shtick is that they play “Tu musica, en Ingles” (Your music, in English). A song started up that was unfamiliar to me. THANKFULLY, the kids again were not in the car because I would have created a sonic boom due to how quickly my hand leapt to the radio buttons to turn it off. It was Eamon‘s “F**k It (I Don’t Want You Back)”. This song contains eight utterances of the F-word in its chorus, which only has eight lines. It has another of Carlin’s Seven Words and other langauge that would send Terry Rakolta into a letter-writing rage. The lone exception of a song being censored that I have discovered so far is “Lighters” with Bruno Mars. The sections rapped by Eminem and by Royce have noticeable audible gaps where the swear words would be. As if dodging combis and taxis weren’t enough of a distraction on Peru’s roads, now I have to have an ear out for what’s playing on the radio. Then again…it could be a wonderful learning opportunity to teach my children about the richness of language. As Carlin said, “There are no bad words, bad thoughts, bad intentions, and wooooords”. Final Note: Today’s title, for the non-Spanish speaker, translates to “The Seven Words”. It’s autumn here in the Southern Hemisphere and for the first time since late December of 2010, I will be able to experience the season that is so splendid, it goes by two names. For a recap of why I missed fall (and to once again read a truly horrific pun), you can warp on back to this previous entry of mine. Back in the old homestead of Virginia, when the autumnal equinox would roll around, it was always a delight to see the leaves turn colors. 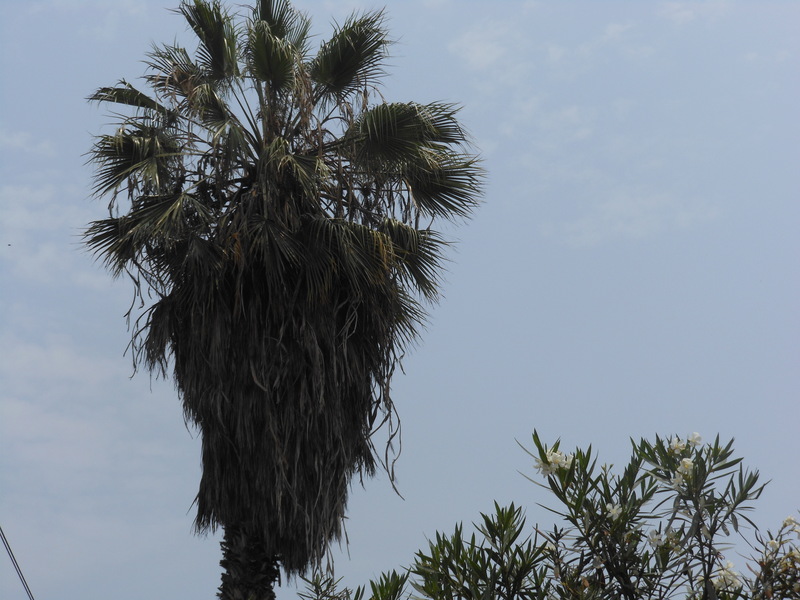 Here in Peru, it is no different, as in honor of the change of seasons, the palm trees outside our home are modifying their hues and shedding their foliage. Then again, that chromatic change at the bottom of the palm’s “greenery” could be due to all the exhaust pollution caused by the plethora of autos (cars, taxis, combis, etc. )in the area. Either way, Happy Equinox to y’all. Final Note: The whole balancing-an-egg-on-the-equinox thing is a myth. A tip of the hat for that information goes to Snopes.com.